Since I will be using the onboard 5.1 sound and the onboard NIC on the 8K5A2+, I have no more PCI devices to install. I will now move on to the drives. Below is a DVD-ROM drive. 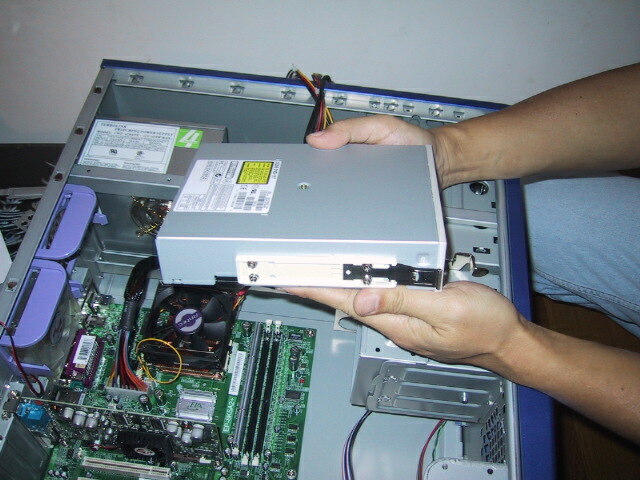 I have already installed the drive rails (the use of drive rails varies from case to case and your particular case may not have them) as shown in the picture. 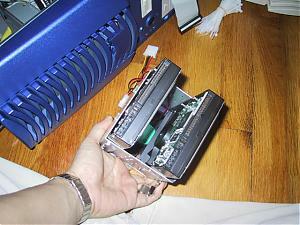 I prefer to install the external drives before working on the internal drives. You can change that order if that is your preference. ...until you hear the click. 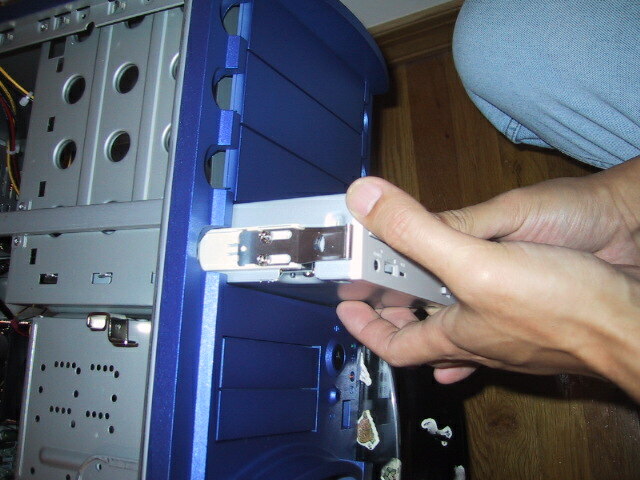 Connect the IDE cable to the DVD-ROM. Check your manual to make sure you have the settings for Master/Slave/Cable Select correct. In the picture below, I have it set for Master and I have connected the DVD-ROM to the end of the IDE cable. 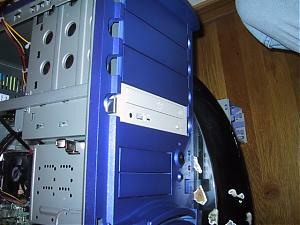 Next is the floppy drive installation. 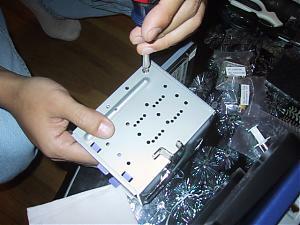 This particular case uses cages for all the 3.5" devices. 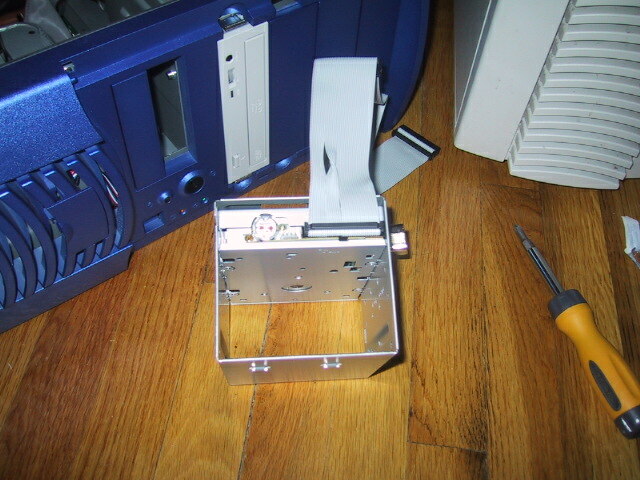 As you can see in the picture below, I have already screwed the floppy into the cage and attached the floppy cable. Now we’re ready for the hard disk installation. In the below picture, I’m screwing one of the drives into the cage. Since I will be running a RAID 0 configuration. I have installed two matching harddisks. To run RAID 0, they don’t have to match, but it’s best if they do. This particular drive cage allows the installation of an 80mm fan to keep the drives cool. You can see it towards the back of the cage. 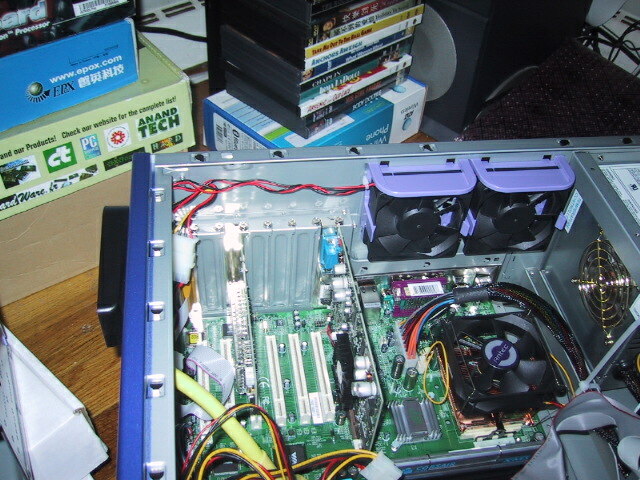 You can’t tell from the picture, but both drives are set to Master. I will be running each drive on a separate IDE channel on the RAID controller. We're in the final lap now! 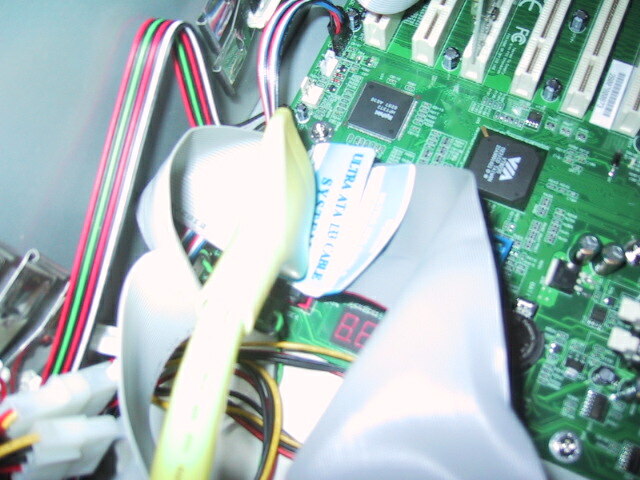 Plug the floppy cable into the floppy plug on the motherboard. Plug the IDE cable from the DVD-ROM into IDE 1. 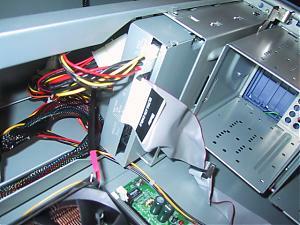 Plug the two IDE cables from the harddisks into the RAID controller. Last, but not least, is the case fan installation. 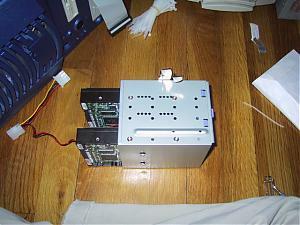 Connect the molexes from the PSU to the case fans connectors. Tie down all lose wires and cables with cables ties. Connect the monitor, keyboard, and mouse. You’re now ready to turn it on. If you’ve done everything correctly, the machine should beep once and go into the “Power On Self Test” mode. 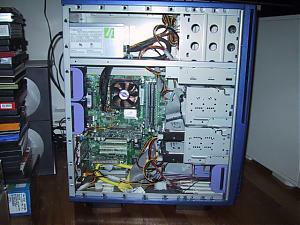 Once you get past that, you change various settings in the BIOS to suit your needs and install your OS. An operational machine. 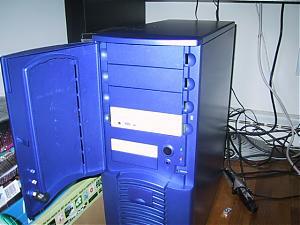 You can't tell from the picture, the the CPU fan is spinning. The flash from the camera froze it in place. We're done and we are...outta here!!!! EDIT: If anyone has any suggestions, please feel free to PM me. I am willing to listen to any input since I may very well have missed something and I really don't want a beginner messing up their machine because I missed or forgot something. Thanks all. Last edited by mookydooky; 22nd November, 2002 at 06:08 AM.